There’s a lot of talk about social networks, but too often the emphasis is on Facebook or Twitter techniques. The essential quality of today’s marketing is not the social platforms themselves but how you build effective networks — online and offline — and leverage them to grow your business. You have to build relationships with consumers and partners. 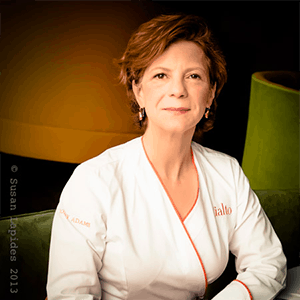 We’re big fans of local Chef/Restaurateur Jody Adams. She has done a remarkable job of building networks offline and has made a good start in maintaining and building on those relationships through online content efforts. She’s not merely a James Beard Award winner or a former contestent on Top Chef Masters, she is a savvy self publisher who is clearly seeking ways to build her brand. Chef Adams has very nice websites for both of her restaurants Rialto and Trade. The content on the websites is very easy to navigate. But what stands out about them is that they embrace the larger community and the wider web. Adams embraces what we call the Galilean model of the web universe. The sites are great on their own, but they demonstrate real value in connecting the whole community. For example, the home page of Rialto site highlights two links under the heading “We Support”. One of those links was to the Greater Boston Food Bank Hunger Brunch, which was a recent charity event. The other link is to The Garum Factory, a fun and beautiful culinary blog run by Adams and her husband, Ken Rivard. (As an avid food fermenter, I really dig the title too!) On the Trade site, there is a Friends of Trade page. This page gives links to Adams’ business partners and vendors, including local farms and companies like Iggy’s bread and Christina’s Ice Cream, as well as to the Fort Point community where Trade is located. All the online properties are also clearly tied together with social media pages that have frequent content and interaction. The aggregate effect of these and other efforts is a picture of a business willing to engage transparently with both customers and partners. The real-life network is mirrored online. The real-life love and passion for food is demonstrated online. This network is also tied into Chef Adams’ mission to promote and use local, sustainable ingredients. She is invested in the community and they are invested in her success. She even takes field trips with what she calls the ‘Guerrilla Grilling‘ team and writes about her food adventures in the community at large, including visits to local farms and places like Taza Chocolate, the centerpiece ingredient in some of her desserts. With this fantastic transparency, community, and network in place, it would be interesting to see Chef Adams deepening some of these relationships. The brandscape of partners who share a complementary vision is all there, but what if they were to find a way to play off each other’s strengths even more? Perhaps Chef Adams and Taza Chocolate could provide recipes for each other’s blogs once a month? Perhaps Guerrilla Grilling could be blown up into a online video series underwritten by a grill brand, like Weber, while still promoting local producers? Perhaps the video series could grow into a cable TV show with even more underwriters and a broadcast partner? We are just seeing the beginning of a marketing revolution. Forward thinkers like Chef Adams who already see the value of a rising tide lifting all ships have unique opportunities ahead. By understanding how different brands can work together, we can conceive of a whole new world of connections where the truly quality talent, products, and services combine to forge a whole new definition of marketing and media.